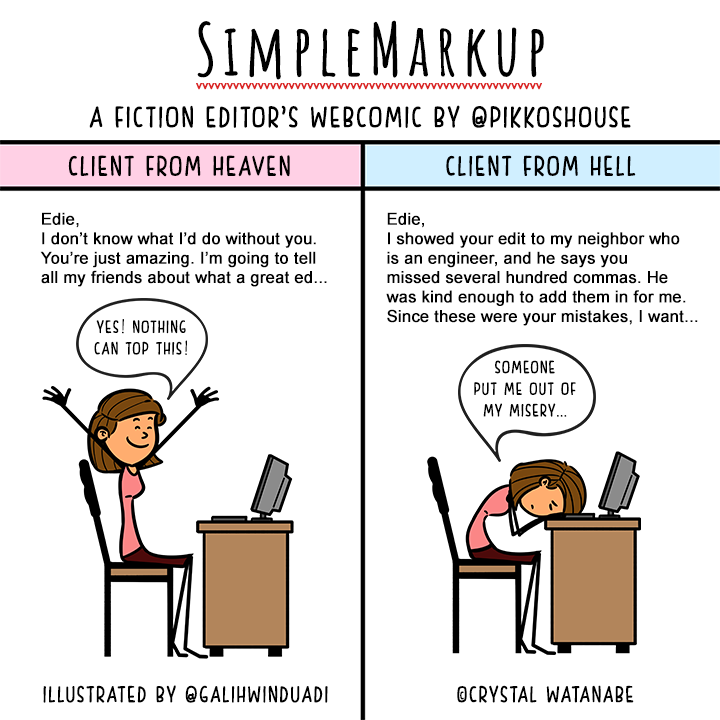 This week on SimpleMarkup, I address something that is the nightmare of many an editor. Some of us don’t even realize this is a possibility until, like me, you read about some other poor soul who went through it. Suddenly your eyes bug out, your hand covers your mouth, and you wonder, Could this happen to me?! 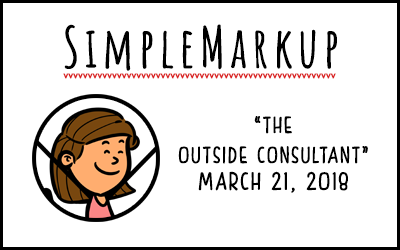 I sure hope it never does, but this week I’ve seen two articles on Facebook sharing the worst of Clients from Hell, the site that lets you howl with laughter—and sometimes with a painful sense of comraderie—while praying the clients being mentioned never darken your doorstep. Anyway, these articles made me remember not one but two editors I’ve seen go through this in Facebook discussion groups. I don’t remember if they edit fiction, but it doesn’t really matter—it’s happened! There are a couple of things to learn here for people on both sides. For authors, the lesson is that if you hire a professional editor and do your homework on them, making sure their credentials line up, that the two of you are a good fit, then you should trust them for what you hired them for. There are a lot of people who are smarter than I am. There are thousands of people smarter than editors—in different fields. In my life, I have met many PhDs. They’re incredibly smart people who could talk circles around me in a wide variety of subjects. But few of them could write. Editors are in the business of words. We study guides. We own or subscribe to dictionaries. We read just to research the art of reading. We can spend an hour arguing over the complexity of a single sentence. You wouldn’t let an astrophysicist do your colonoscopy, would you? Point is, keep your manuscript in the hands of a verified word nerd. If something goes wrong in the area of voice or quality, find another editor. Just because someone can write sentences doesn’t mean they can fix sentences. Yes, there are engineers and scientists out there who can write and edit like pros. Heck, Carla, one of my proofreaders, has a master’s in polymer science, but automatically vetting someone else on their merit in a different field to second guess your editor may not be the best idea. I knew Carla was an amazing word nerd and grammar stickler for years before she started proofreading for Pikko’s House. As for editors, the lesson here is not to bang your head too hard on your desk if this happens to you. Seriously, you might kill a few too many brain cells, and those 300 engineering commas might start making sense.